An illegal case of fishing and hunting under Sangdupota Circle of Papum Pare district settled locally. A press release issued by the United Sangdupota Intellectual Youth Forum (USIYF) , said that a case of illegal fishing and hunting was amicably settled by help of USIYF, All Bassarnallo Youth Association (ABYA) with concern Goan Buras, Panchayat leaders and seniors of the area on January 8. 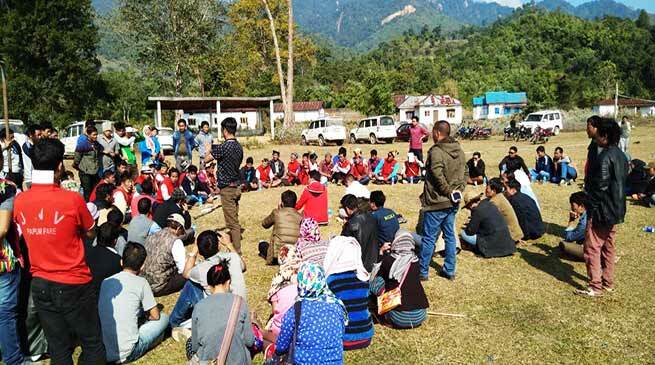 During the settlement of local case the group of outsiders accepted and agreed that they have committed mistake by disobeying/breaking the rules & regulations and bylaws of youth bodies/associations and Panchayat under the Jurisdiction of Sangdupota circle, Papum Pare District. Also, fine was imposed according to the framed bylaw and the group has written apology and promised not to repeat the same in near future. USIYF further warned anyone those who are engaged in such activities to refrain use of chemicals and other harmful substance in river which directly affect the aquatic animals. However, it was confirmed from the Papum Pare Police that a case at Balijan Police Station was registered vide case No- 3/18 u/s-447/277/34 IPC.